A pipe fitting underneath the bathtub of this 2-story townhome home broke and started gushing water everywhere. The water spread down through the walls and the ceiling, shorting some of the electrical connections and seeped down to the basement where it pooled. 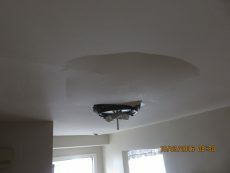 The water ruined a great deal of the drywall in the home as well as destroying the carpeting, hardwood flooring and ceiling. Cityline was hired for emergency work on the home as well as restoration work. Our team of experts arrived and assessed the damage done to the home and estimated the extent of repair work that would need to be done on the property. They also determined which drywalls were in need of immediate care by using moisture reading technology to identify the areas saturated with water to prevent further damage to the property. After assessing the work that needed to be done, we brought in our team that same day to get started right away. We immediately went to work removing the damaged drywall and property from the home. We also removed all the carpeting to prevent mold growth. While we were removing the damage we started that same day with the drying process. We brought in our drying equipment for dealing with pooling water to remove it before it caused further damage to the floors. Since our team acted quick enough we were able to prevent the damage to the property from getting out of hand. Once the immediate remediation was completed and the drying process was underway, we started to intensively clean the possessions inside the home. We did this while paying extra attention not to damage the integrity of the item. With the possessions cleaned we packed them out and moved them into our offsite climate controlled storage facility. Our experience came in handy here as we were able to salvage all of the items from the home. The home owner was delighted about this. After all the personal property was carefully packed and removed from the property and had the damaged dry wall removed we worked on cleaning out the air of bacteria and other toxins. Using our tools, we extracted the toxins out of the walls and removed them from the property. The other added benefit of doing this is the clean smell the home has after the air was purified and filtered. The next stage of construction required our in-house electricians to remove the old wiring in the home and replace it with new wiring, along with replacing the electrical fixtures. Our plumbing crew went to work replacing the broken pipe fitting and to making sure there were no other pipes in the building that were at risk of failure. With the insides of the wall filled up we covered it with new drywall and repainted the entire home to give it a vibrant new color. With new walls and fabulous painting done it was time for us to put back in the carpeting. With the homeowner’s help, we had picked out a new carpet to put down in the home all on the first and second floor and we picked out a new hardwood floor for the entrance. When the carpet was laid down and cleaned off the place looked stunning. With construction finished, the home underwent a through post construction final cleaning and upon conclusion, all personal property was returned to the home and reset exactly as we found them. We keep one OCD guy on the crew to make sure this is done perfectly. The home owner was very happy with the work we provided and has since written a glowing review about the work we provided for him.